Cuban Foreign Minister Bruno Rodriguez received US Secretary of State John Kerry at the headquarters of the Foreign Ministry in Havana on Monday morning. The meeting was held in a respectful and constructive environment. 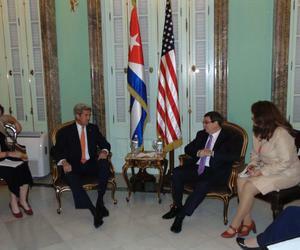 The two officials exchanged on the current situation of the ties between Cuba and the US, including the results of the joint work since the reestablishment of diplomatic relations, especially, in the cooperation in areas of mutual benefit and the dialogue of bilateral and multilateral issues, as well as the next steps to move forward to improve relations. Minister Rodriguez acknowledged president Obama's position in favor of the lifting of the US embargo, and the measures taken to modify its application that, though positives, are still insufficient to create mutually profitable economic relations. He stressed that to have normal relations it will be essential that the US lift the embargo, the devolution of the occupied territory of the Guantanamo Bay naval base, and for policies that are hurtful to Cuban sovereignty to be eliminated. Both sides agreed that there still differences between the two governments in issues as political systems, democracy, human rights, the concept of national sovereignty and the application and understanding of the International Law.